So you’ve decided to buy a ticket and hop on a big jet plant all the way to Australia, but you’re stuck on the eternal question: Sydney or Melbourne? As the country’s two biggest cities, it can be hard to know which one echoes your vibes. A quick Google search will probably reveal copious arguments for both, along with comparative percentages, scores and ranks for each city under categories like Culture, Food, and Nightlife – all of which are inherently subjective. What constitutes as ‘culture’ and ‘good food’ to one person isn’t necessarily the case for another. On top of that, people born and raised in Melbourne will most-likely tell you it’s the superior city, the official City of Melbourne will unashamedly come right out and say ‘Melbourne is better’, while Sydney-siders will have mixed opinions…but how do you know? I’m going to try and give you an unbiased breakdown of both cities (bonus info at the bottom!) to try and help you figure it out. As the larger city with 5.1-million people, Sydney has a range of different suburbs and alcoves with different vibes for you to explore (click here for more details), that are varying distances from the CBD (City Business District, basically ‘downtown’). You could venture an hour out of Sydney CBD and find a range of different suburbs to check out that will be quite different from one another. For example, heading from Bondi Beach (pronounced ‘bond-eye’, not ‘bond-ee’ – you’re welcome) to Newtown might take you 40-mins to an hour by bus, and the difference between the two places is pretty extravagant. Travelling from Newtown to somewhere like Parramatta or Cabramatta (an extra hour or so) will again reveal something completely different, and so on – Sydney is quite expansive, and there’s a lot to explore. On the other hand, Melbourne (4.8-million people) is quite centralized. There are a few suburbs around the CBD that are definitely worth a visit (click here for more info), but heading out further than, say, Northcote won’t really reveal much. For example, heading from the beach suburb of St Kilda to somewhere like trendy Fitzroy might take you 45-mins or so on a tram, and then heading to Northcote might take 20-mins on top of that, but that’s pretty much the extent of how far you can go without venturing deep in to suburbia. You can explore much more of the city in less time, and the place is designed on a grid and easy to navigate around. There’s not as much to look at. Spending a week or so there will probably be enough time to see what there is to see. There’s more of the city to explore. While the weather in Sydney is quite mild (the temperature only drops below 12 in the depths of July, mainly sticking to around 14-16 in the winter months, hovers between 25 and 37 in spring and summer, and is relatively dry), Melbourne is a land of extremes – it gets very hot, very cold, and it’s not uncommon to experience all four seasons in one day. As the more southerly city, Melbourne is privy to arctic winds in a way that Sydney just isn’t. It generally stays cooler, breezier, and wetter in Melbourne for a longer period of time than it does in Sydney. Its’ the kind of relentless rain that exists in Vancouver and London. Melbourne has a lot of cafes and restaurants with outdoor heaters. It has a cozier vibe than Sydney and, if you dress warmly and bring an umbrella, meandering through the alleyways and artisan shops can be fun. It’s colder for longer, windy, and sightseeing can be really difficult in the cold and rain. It’s sunny most of the time, the days are clear, and you probably won’t get cold. There are probably more extreme weather events in Sydney (hail, intense thunder storms), but they’re very infrequent. It can also get super-freaking-hot in the middle of summer, but that happens in Melbourne too. In all honesty, there really aren’t many cons in this department. 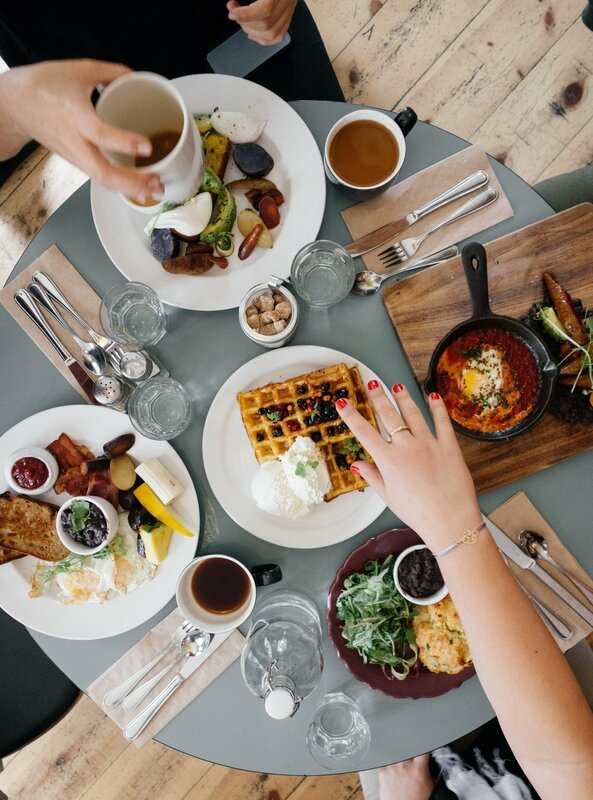 There’s no question food and coffee in both cities is a big deal, and there are areas of both places that serve amazing food and coffee, no matter what your dietary specifications might be. Gluten-free options are on the rise everywhere, vegan options are becoming more widespread in both locations, and you can find soy milk and dairy-free milk alternatives almost all over the country. Breakfast is the biggest deal ever in both locations, Australians are coffee snobs (there, I said it!) and, while there are folks who will state the ‘best’ breakfast or coffee is here or there, it’s highly subjective. Just take my word for it, no matter where you go, you will find amazing breakfasts and coffee if you do a little research. There are no pros and cons for this section because both cities take consumables pretty seriously, and they’re incomparable. One photo below was taken in Sydney, one in Melbourne, but what looks better? Some will prefer waffles, some will prefer eggs – it’s in the eye of the beholder! Both cities have a substantial number of bars and clubs scattered about the place, so it’s all about what works for you. If you’re after clubs, Melbourne is probably the place to go. There are less restrictions in Victoria than there are in NSW, meaning the club scene still thumps away, and for longer, each evening. As something to note, Australia has some pretty strict alcohol laws in general (you’re not allowed to be drunk in a bar, for example…go figure), but Sydney (and NSW in general) has definitely felt the full brunt of these restrictions. Anti-party laws set by the NSW government over the last few years have been almost irreparably detrimental to the nightlife in the CBD, but the restrictions don’t apply to areas outside the CBD so places like Newtown and Bondi are still going after 1pm. Smaller bars exist in both cities, though I’d say Melbourne probably has more. You can wander the streets of Melbourne CBD and stumble upon many different wine bars, tapas places, and hideaway rooftop bars that you won’t find unless you know what to look for. Sydney definitely has ‘secret’ places like this, but coming across little wine bars is less likely, and they’re more widespread so you really have to know where you’re going. Unless you’re somewhere like Newtown or Surry Hills and they’re all along the main street. You can definitely get your fix of cute little bars in either city, but the main difference is probably that Melbourne has a trendier and more populated scene. More bars in what’s probably a trendier scene, and you don’t have to travel far to find them. Alcohol here is more expensive than it is in Sydney, so a night out will cost you more. There are trendy bars outside the CBD that serve great food and drinks, at lower prices than Melbourne. Stricter laws, not as much to choose from. Melbournians like to talk about how life in their city is cheaper than Sydney, but it’s not necessarily cheaper for a traveller. Rent is mildly cheaper (cities in Australia have expensive rent in general), and there are more private markets and grocers which can make fresh produce cheaper, so meals can be cheaper, but alcohol in Melbourne has been more expensive for a long time ($20 for a small jug of average beers, anyone?). Public transport is also more expensive in Melbourne. Less expensive rent, and sometimes restaurant/café food (depending on where you go. Alcohol is extremely expensive, and public transport is noticeably more expensive. Alcohol and public transport are cheaper. Rent and food are more expensive. Public transport in Australia is generally in a bit of an abysmal state, and Sydney and Melbourne are no exception. Whether you’re on the train, tram, or bus, each mode of transport has a history of being relatively unreliable because of heavy traffic, construction, strikes, being understaffed, or some technical problem. Both cities have also amped up the number ticket officers, so travelling without a ticket carries the very real possibility of being fined $200. It’s not worth it. Both cities have public transport issues, so the only real breakdown I can provide is the different modes of transport. Trams are a big deal in Melbourne – a bigger deal than buses and trains. The good thing about trams is they follow set tracks and often get right of way. They’re definitely faster than buses, and more convenient than the trains. It’s fairly easy to get to wherever you’re going via tram. Trams are not immune to traffic, and still suffer the same congestion as a bus or car. Trams and trains are also fairly unreliable, and workers have been known to strike because of long hours and unfair conditions, leaving the city on chaos. This can happen at any time. While there are only two trams in the city, the train network in Sydney is extensive and, of course, not subject to traffic, so it’s also a lot faster than any other mode of transport. Sydney trains are far superior to the buses, and I’d choose a train over a bus any day – you should be able to get around very easily on the trains. If you’re heading from the city to somewhere like Manly Beach, you can also catch the ferry! It’s definitely faster and more scenic than the bus. Transport in Sydney is unreliable, at best. Sydney traffic is nightmarishly congested, which means even when the buses leave the depot on time, half of them don’t have a chance of reaching their destination on time – the odds are stacked against them. Trains are also often late, and there always seems to be some sort of technical failure because, confusingly, the tracks and signal boxes aren’t equipped to deal with weather…it’s always too hot or cold and the tracks are malfunctioning, or there was too much rain, a signal box was struck by lightening, it hailed and everything went wrong…there’s always something going on. It’s best to check the situation online before jumping on a train to something important, like a flight. On the other hand, the ferries are pretty reliable. While Melbourne has a few landmarks worth seeing (the ‘Melbourne Star’, Flinders St Station, Degraves Street, the Yarra River, St Kilda, Queen Victoria Markets, Prahran Markets), in all honesty, Sydney Harbour and the surrounds is a jaw-dropping spectacle. It sparkles in the sunshine, lights up at night, and looks different from all angles. Plus, if you’re in it for the beaches, Sydney has an array of wavey and flat beaches to choose from, and Melbourne’s easy-to-get-to beach (St Kilda) is completely flat. All in all, Sydney is a brighter city – blue sky emerges often so there’s more greenery, and clouds don’t hover over the cityscape nearly as much as they do in Melbourne. In short, Melbourne is an experience, rather than a site. You go there to hang out in the alleyways, check out the small bars and coffee shops, and go shopping. Sydney is more about the sights and experiencing a range of different cultures in the one city. The ‘Melbourne Star’ (a giant ferris wheel) is an interesting thing that Sydney doesn’t have, St Kilda Beach has a more ‘hippy’ vibe compared to Sydney’s beaches, the Queen Victoria Markets and the Prahran Markets are must-see destinations, and Southbank (the Yarra River) is a nice place to hang in the warmer months. Melbourne also has it’s own version of Luna Park (a fun park with rides in St Kilda). There isn’t an abundance of sights to see, and city in general isn’t as bright, clear, or green as Sydney. St Kilda is more of a flat bay than a beach. Sydney Harbour, Hyde Park, so many beaches (Bondi, Tamarama, Coogee, Manly, Maroubra), Luna Park (yes, Sydney has one too, only this one is under the Harbour Bridge), greenery, frequent blue skies – the list goes on. Sydney is more of a sightseeing destination. Well this is awkward… In terms of sightseeing, there are no clear cons in this city, though I will say there are no markets in Sydney that compare to Melbourne’s Queen Victoria Markets (Paddy’s Market doesn’t compare). Melbourne has long been touted the shopping capital, and it’s probably true. With areas like Chapel Street, St Kilda, Bourke Street, Brunswick Street, and Hawthorn markets (if you love thrifting, you need to go there asap), you can really go nuts shopping in this city. Whether you’re after new or thrifted wearables, the variety is extraordinary. Of course Sydney has shopping options, but there probably aren’t as many unique areas devoted solely to retail therapy. Newtown has a lot of niche and vintage stores, but new stuff is largely kept in the giant shopping malls of Pitt Street, Burwood, and Bondi Junction. More variety, areas, and options for new stuff and vintage finds that suit all budgets. Newtown and the Inner West is a hotspot for vintage finds; Rozelle markets and Eveleigh markets are great to visit on Saturdays, and there are some gigantic shopping malls in major suburbs that tonnes of options. It’s more commercial – the amount of vintage stores doesn’t even compare with Melbourne, and there aren’t as many locations to shop in. I’m only including this one because it seems to be a major topic, but really, what is ‘culture’? I would say each suburb in Sydney has a different culture, and Melbourne has a more defined city-wide culture, but the ‘culture’ of a place is really dependant on your personal beliefs and experience. To try and define what Melbournians are going on about when they speculate that their city has more ‘culture’, they’re talking about the hipster and cafe vibes. There’s a ‘niche’ mentality in Melbourne that permeates almost every aspect of the city – niche cafes, vintage stores, bars, clubs, shops, art, and even bookstores. Everything is seen as very unique and different. Sydney has a varying culture. Generally speaking, there’s more business in Sydney because it’s significantly bigger, so there’s a culture of people in the CBD in suits who are working from nine to five. If you expand from there, you’ll find an alternative and trendier culture in Newtown and the Inner West, a cultural mixture between yoga mum and backpacker in Bondi, an upper-class/big house culture on the North Shore, and it continues to differ depending on what part of the city you’re in. Sydney’s culture is vast and not as obvious as the Melbourne culture, but that’s not to say it doesn’t exist. A more centralized, well-rounded, and defined idea of what the main culture is. It’s quite easy to get a sense of it after a few days, and pretty easy to determine whether you like it or not. The culture is very defined and prominent. If you don’t like it, you can’t just visit another part of the city to get away from it – it’s everywhere. An abundance of different cultures scattered around the place. Don’t like the vibes in the CBD? Head to the beach for something different! It can be difficult to find the culture here because it’s so dynamic and relevant to where you are in the city. Some people hate this because they don’t want to have to search for it. Because Sydney is more business-focused, it can (and has) been seen by foreign and local travellers as cold, distant, and unfriendly. The CBD can be a little like that (imagine suited-up lawyers, accountants, and executives storming about the place with briefcases on weekdays), but that’s only one part of Sydney. I know I keep saying it, but travelling out of the CBD in Sydney will give you a totally different experience. Sydney-siders are looking for friends who share their values (whatever they may be), and forming friendly relationships is more dependent on what part of the city you’re in. In Melbourne, on the other hand, the defined ‘niche’ culture means the people of Melbourne have a solid idea of what their city is and what it should continue to be, and there’s a slight legacy of unfriendliness toward people who challenge it. Not everyone has this experience, but it’s not uncommon to find the people of Melbourne a little cold and unfriendly if you’re vocal about not liking the vibe, or (oddly) if you prefer Sydney. If you like the vibe and fit in, you probably won’t have any problems making friends. Friendship groups can be cliquey, and many have found it quite difficult to make friends in the city. If you don’t make friends in one area, you can always try another – there isn’t really a culture specific to the whole city, so it shouldn’t be too hard to find your people. It can come off as an unfriendly city at first. Ultimately, the decision as to whether you should live in Sydney or Melbourne is very subjective and no amount of numerical scores or opinion pieces can figure it out for you. The best part about the two cities is that they’re only separated by an hour-long plane ride that can cost anywhere between $30-100, so you can visit both and decide! Do I have a preference? Of course! Am I going to make a point of it? No. I don’t want to influence anyone’s decision-making, though I will say the weather plays a big part in the liveability of a city for me, so I definitely recommend taking it in to consideration. People who love Vancouver, London, or Wellington tend to prefer Melbourne. Still not sure which you’d prefer? Take the quiz to find out!